The Israeli-American Council’s www.israeliamerican.org Sifriyat Pijama B’America (SP-BA), which together with the Harold Grinspoon Foundation provides free monthly Hebrew children’s books to families in the United States, has partnered with Storyly, a new online platform for children’s Hebrew stories, to offer Israeli parents across the United States an innovative, fun way to improve their children’s Hebrew language skills while nurturing a love of Israeli culture. The Israeli-American Council (IAC), will sponsor free Storyly subscriptions to SP-BA members as part of this partnership. Storyly’s pioneering service allows children to have dozens of Hebrew books read to them online as audio e-books, or read to them by friends or relatives including grandparents, aunts or uncles, live on a shared online screen. Children can bond with loved ones far away while being excited by the Hebrew language through the rich world of Israeli children’s books. Please read more information on the partnership between SP-BA and Storyly, and subscribe. SP-BA, the Hebrew version of PJ Library, offers Jewish children, ages 2-8, and their families an opportunity to create a tradition of reading stories in Hebrew together and enjoying meaningful conversations on Jewish topics and themes at home. The goal is to foster affinity for and knowledge of Jewish values from a young age while connecting them to Israel. “Storyly brings Israeli story time into our home in America. My kids love it as it offers great books, and I love that it feels like our family here and in Israel is sitting in one room and enjoying reading together,” said SP-BA and Storyly subscriber, Sharon Rechter of Los Angeles, mother to Noa, 7 and Neta, 4. Get more information on registering for free SP-BA books and becoming eligible for a free Storyly subscription today! Impressed by the selection offered by his channel, I asked Guy how he got so many videos. “My collection is a result of decades of preserving old VCR cassettes with original recordings from Israeli TV, mainly with Israeli Music,” he said. After I started my new hobby, of uploading my materials and sharing them with the world, the rumor of what I did spread and got to many people, who generously donated their own collections, or just old VCR cassettes for the noble cause. “I started my journey with a small, beautiful clip sang by Netan’ela — one of my favorites singers,” recalls Alon. I uploaded it on August 2006, to share with some of my friends, and was overwhelmed with the huge number of responses I got, from within Israel, and Jewish people worldwide, asking for more materials from the good old Israeli music. Since then I decided to slowly share my collection with everyone, with a goal to upload one new clip every day, a task I am proud to say that I managed to achieve. Today, my YouTube channel has more than 2000 clips that I uploaded, and is one of the most popular private YouTube channels in Israel. And how about personal favorites? “My favorite artist is Matti Caspi,” Alon says. I think he is a true musical genius. One that if was born in another country would have become one of the most succesful artist in the world. His music is so rich and deep that I can never get enough of it. Another artist I love to hear is Idan Raichel. He is a very talented musician, with original material of his own. He is also seems to be a very nice and modest person. Hidden City Philadelphia and the Mural Arts Program are joining forces this weekend to offer a bus tour that visits Hidden City festival sites, as well as some of the city’s more prominent murals in South Philadelphia and Old City. The tour will be held at 1:00 pm every day from Thursday, June 20 to Sunday, June 30. The tour costs $35 per person and includes a one-day Hidden City Festival Pass. The tour begins at John Grass Wood Turning, 141 North 3rd Street, a legacy woodturning business started by Bavarian immigrant John Grass in 1863 that closed in 2003. The workshop has remained intact and essentially unchanged for a century. Located in America’s first manufacturing district (and crucible of Philadelphia’s “Workshop of the World”), the company made tool handles, flag poles and furniture — almost anything made of wood that needed to be turned on a lathe. The on-site Wood Shop project serves as a pilot project to introduce John Grass to the wider public, to exhibit handcrafted products created throughout its 160-year history and as a custom railing and balustrade by maker Joe McTeague, who will be incorporating found lathe-turned products created at John Grass. Later, the tour visits Shivtei Yeshuron-Ezras Israel, a small converted storefront synagogue from 1909. 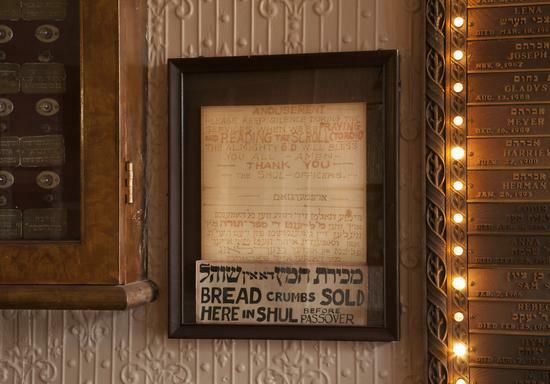 In the century since, as Jewish South Philly grew then shrunk then grew again, this tiny synagogue has persisted, almost unchanged, as one of the last pre-World War I row house “shuls” of its kind. Textile artist Andrew Dahlgren is working on site in his ADMK Knit Lab. He will meet visitors as he creates a knitted quilt that will cover the facade of the synagogue. In between the two visits, several of the city’s murals will be visited. The six-week Hidden City festival is a unique combination of art, history and architecture, as well as an exercise in building community and imagining new futures for vacant spaces. It will present the largest showing to date in Philadelphia — and one of the largest in the country — of what’s been called “social practice art,” a burgeoning grassroots movement recently spotlighted in The New York Times and also on Philly.com. Punk Jews screening, 7 p.m. on Thursday, June 20 at Shivtei Yeshuron-Ezras Israel, 2015 S. 4th St. Profiling Hassidic punk rockers, Yiddish street performers, African-American Jewish activists and more, Punk Jews explores an emerging movement of provocateurs and committed Jews who are asking, each in his or her own way, what it means to be Jewish in the 21st century. After the screening, co-producer Saul Saludin will hold a Q&A with the audience. Tickets are $10. Independent Germantown Flagmaking Workshop, 12-7 p.m. Sunday at Germantown Town Hall, 5928 Germantown Ave. Come work with Katie Hargrave of the Think Tank that has yet to be named to design and create the new flag of independent Germantown. No prior knowledge required. Drop in any time to contribute. Radical Jewish Music: A Concert Series — Uri Caine plays Moloch. 8 p.m. Monday at Shivtei Yeshuron-Ezras Israel, 2015 S. 4th St. Tickets are $25 online and $30 at the door. Caine is a musician of astonishing virtuosity and versatility. Coming out of the legendary Philly Jazz scene, his playing is an encyclopedia of styles. Ars Nova Workshop, in partnership with Hidden City Philadelphia, holds the third of its three-part concert series featuring the work of composer John Zorn inside this 19th century South Philly synagogue. Tickets for Hidden City Philadelphia are available online at http://festival.hiddencityphil… or over the phone at 267-428-0575. Tickets cost $20 for a one-day pass, $40 for a weekend pass and $70 for an all-festival pass. Hidden City members pay reduced rates of $15 for a one-day pass, $30 for a weekend pass and $50 for an all-festival pass. Hidden City Philadelphia pulls back the curtain on the city’s most remarkable places and connects them to new people, functions and resources. We celebrate the power of place and inspire social action to make our city a better place to live, work and play. We do this through four complementary programs: Hidden City Daily, our online magazine; Hidden City Tours & Events; immersive experiences of remarkable places; and Hidden City Festival, an award-winning and widely acclaimed artistic, historical and community event. Last year, local talent Michael Bihovsky knocked our hypoallergenic socks off with his music parody video One Grain More. Now, he is launching a “fresh” new project. Bihovsky is putting his collegiate experiences to music into “Fresh!” This musical follows Michael from the suburbs of Philadelphia to his new life as a freshman in New York City. Michael sings about his challenges and struggles, and shares the transformation he experiences. This is a show everyone can relate to, as it empathizes with the daily struggles many of us endure. In the end, both Michael and we emerge stronger. Teresa Taylor snuck home one workday at lunch to surprise her nanny. The music was blaring; the nanny was cooking while on her cell phone. Teresa’s infant son was asleep in a swing, with swollen eyes from crying, lying in a soiled diaper. Teresa fired her nanny on the spot but she was due back at work. Her son needed her but so did her coworkers. Taylor, a working mom who, after years of feeling like she was always failing someone — coworkers, kids, husband or friends, finally uncovered the simple truth: she would never achieve the mythical thing called ‘balance’ for which so many women (and men) spend their adult lives searching. In fact, searching for it only creates failure, disappointment and frustration. Thus, Taylor conceived the new book The Balance Myth: Rethinking Work-Life Success . Taylor is a nationally recognized telecom executive who teaches integrity, focus, and vision, to working women everywhere in her new book. Part memoir, part guide and part inspiration, The Balance Myth provides unique yet palpable solutions for women to simplify the complexities of a modern professional lifestyle-from parenting and married life to travel, friendship and business and more. Each chapter includes intimate personal stories — from accepting suicide, to struggling with infertility, to the responsibility that comes with top-level government clearances – which will both inspire and provoke readers to successfully navigate their own overwhelming, personal and professional challenges. Teresa Taylor serves on the board of directors for First Interstate BancSystem, Inc., a financial services holding company with $7.3 billion in assets, as well as the board of directors for NiSource, Inc., a Fortune 500 natural gas and electricity storage and transmission company. Additionally, Taylor is an executive adviser to Governor John Hickenlooper and serves on the Colorado Economic Development Commission. She also serves on the Global Leadership Council for Colorado State University’s College of Business and is a member of the Board of Directors for the Colorado Technology Association. Previously, Ms Taylor was the COO at Qwest, a $12 billion telecommunications and media company, where she held numerous executive positions spanning a successful 23-year tenure. Taylor has been featured in a number of national business publications, including the New York Times and the Wall Street Journal. She is sought after as a speaker on topics including leadership, economic development, and innovation. She resides in Golden, Colorado, with her husband. She has two grown sons. Much to my surprise, the system is outstanding. At the School of Rock, the students immediately begin to learn to play whatever they want. The instructors break down the songs, and the kids learn how to play them. No time is spent on tedious tasks like practicing scales. My son has been learning at the School of Rock for the past three years. He has learned how to play both electric and acoustic guitars. He has written and performed his own songs, and started a band. He loves the way he connects with his teachers: “They have become my friends,” he told me. Many young people are enrolled at the School of Rock. Those who join the School of Rock’s bands have the opportunity to make meaningful new friendships. A great way to get a taste of the School of Rock is by enrolling in a summer camp session. It lasts long enough to understand what the School of Rock is all about. One of the coolest things about the School of Rock is that the professional bands on tour in Philadelphia drop in. When they do, they jam with the School of Rock’s students.